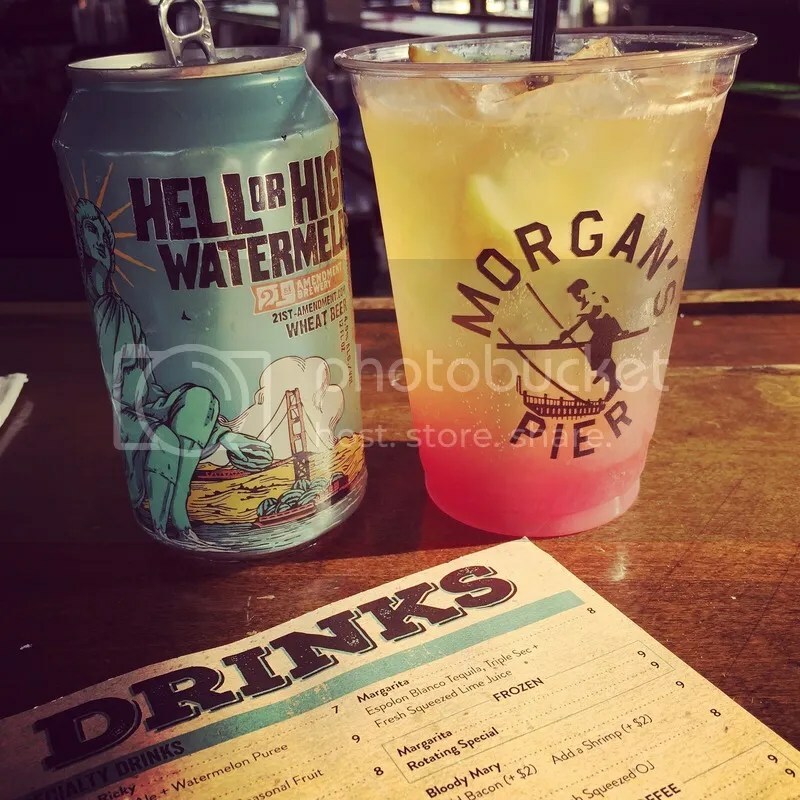 Ok, so technically Morgan’s Pier isn’t a beer garden per se (and technically, I’ve already been there before), but it is outdoors and they do serve beer, so it totally counts! Not to mention, they’ve been changing up the chef lineup every year since it opened in 2012 (this year it’s being helmed by Nick Elmi of Top Chef fame), so it’s a whole new menu to try out. So how does it compare to my last visit? I started with their signature Watermelon Ricky – a 21st Amendment Hell or High Watermelon poured over lemon juice & watermelon puree. It’s the perfect refreshment for a hot day. For eats, I went with the backyard burger – topped with lettuce, pickles, sharp American cheese and house sauce. You can add on coleslaw, fries or beans for an extra $3 so I said why not? The burger was only $7 (seems I’m on a bit of a downward sliding scale from my previous beer garden trips thus far). I wasn’t asked how I wanted the burger cooked, but it came out perfectly medium; bright pink inside and perfectly juicy. It was a simple backyard burger on a potato bun – tasty and no frills. 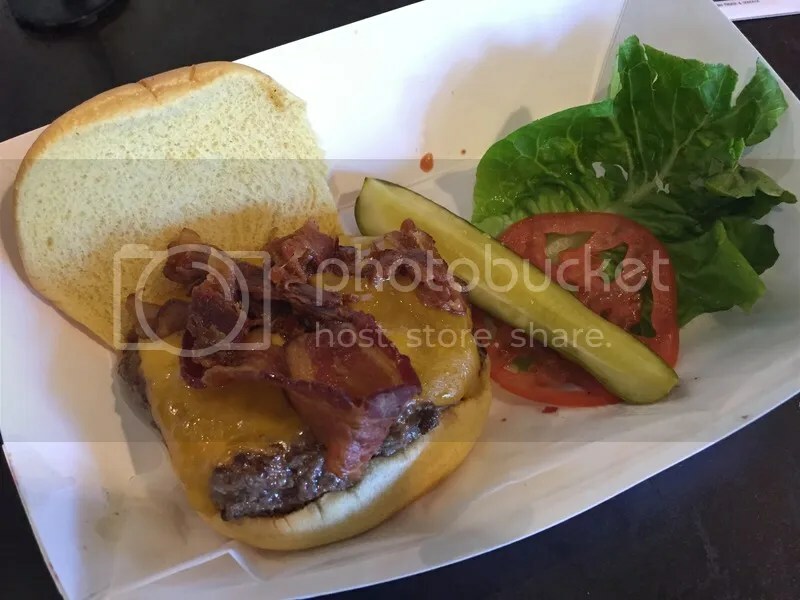 I’ll definitely have to come back with a bigger appetite to try the double stacked Pier burger that comes topped with local bacon made by 1732 meats. I would skip the fries, though. 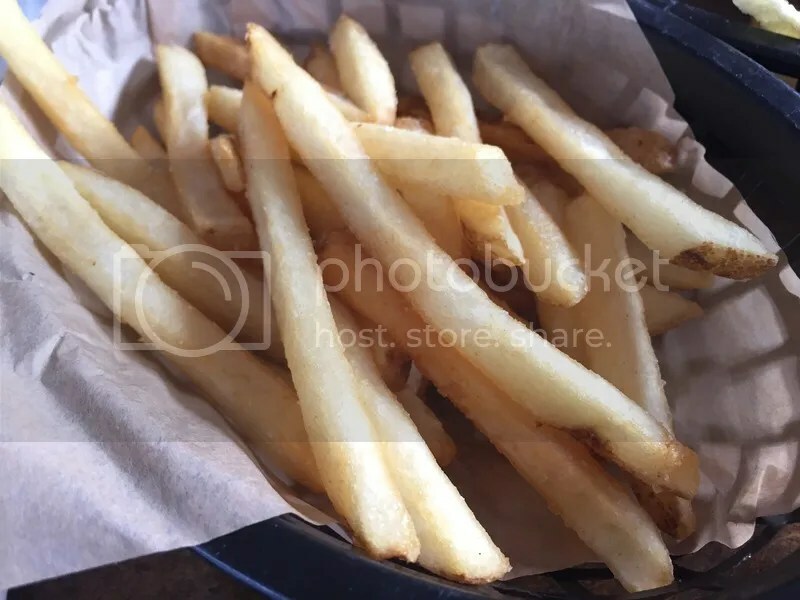 Compared to my last trip where I got a mountain of hand-cut seasoned fries for $3, these were clearly straight from a bag frozen fries (my gut totally said coleslaw, too, which proves that you should always go with your gut). Morgan’s Pier is open 7 days a week and there’s plenty of room around the pier to hang out with your friends or fly solo and sit by the water watching the boats come in. Plus there’s Quizzo on Tuesdays, brunch on the weekends & live music pretty much every other night of the week. Even better: come on a night when the Camden Riversharks have post-game fireworks and you’ve got an amazing view! 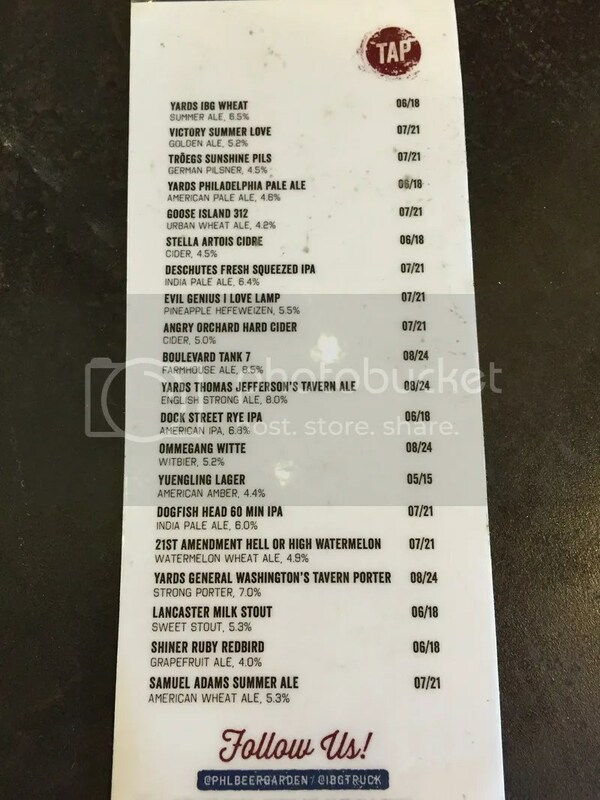 Posted in 1732 meats, American cheese, beer, beer garden, Fireworks, fries, Morgan's Pier, Nick Elmi, no frills, no-frills, pickles, summer, watermelon. Bookmark the permalink. I never made it over to the Independence Beer Garden last season, but I did check out their mobile truck when it was parked over at Festival Pier and had a really solid burger. I was excited to get over to check out the IBG this year and hoping for the same result burger-wise. 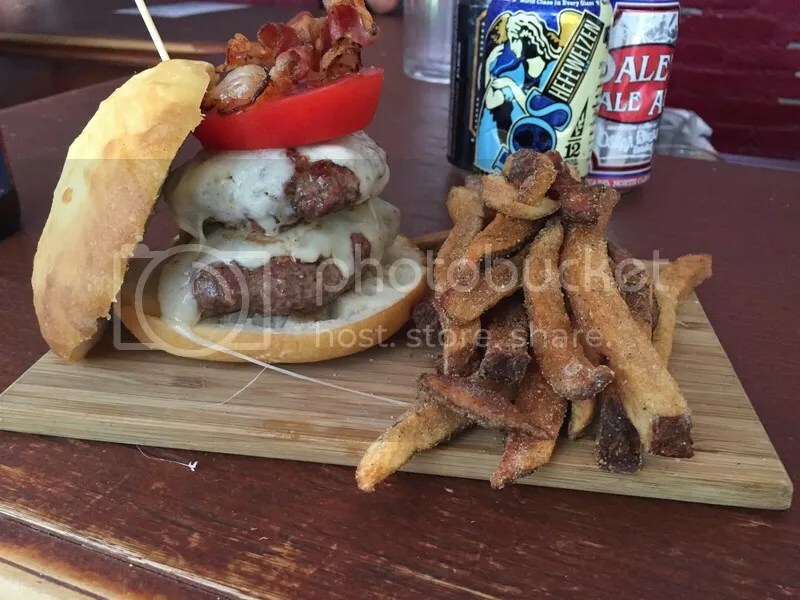 The burger here comes topped with cheddar, bacon, lettuce & tomato on a potato bun. Even though this burger is $8 with no sides, the presentation was certainly nicer than the $9 burger I got last week. The patty was also much thicker! It was cooked perfectly to medium as requested and was flavorful & juicy. The bacon was crisp & the cheddar cheese thick & gooey. Plus, burgers just taste better on a potato bun! It was the perfect backyard burger & it pairs great with any one of the amazing Summer beers on tap (I went with a Shiner Ruby Redbird & the Yards IBG Wheat). Posted in bacon, beer, beer garden, buns, burger, cheddar, cheese, Independence Beer Garden, potato bun, potato roll. Bookmark the permalink. I had every intention of spending a beautiful, warm, sunny July 4th evening outside imbibing on alcoholic beverages & eating grilled meat. 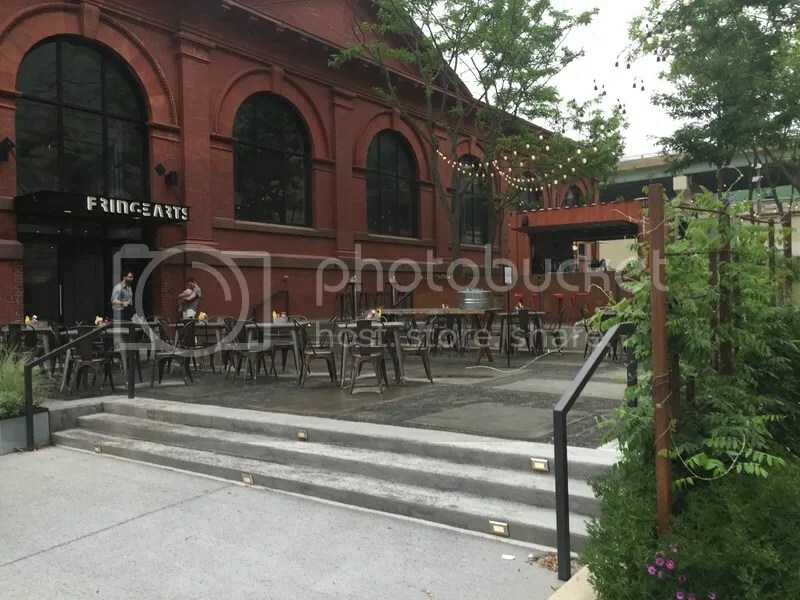 However, Mother Nature had other plans so I was forced to eat inside at the bar of La Peg – one of the newest restaurants on the Delaware waterfront, brought to you by FringeArts. 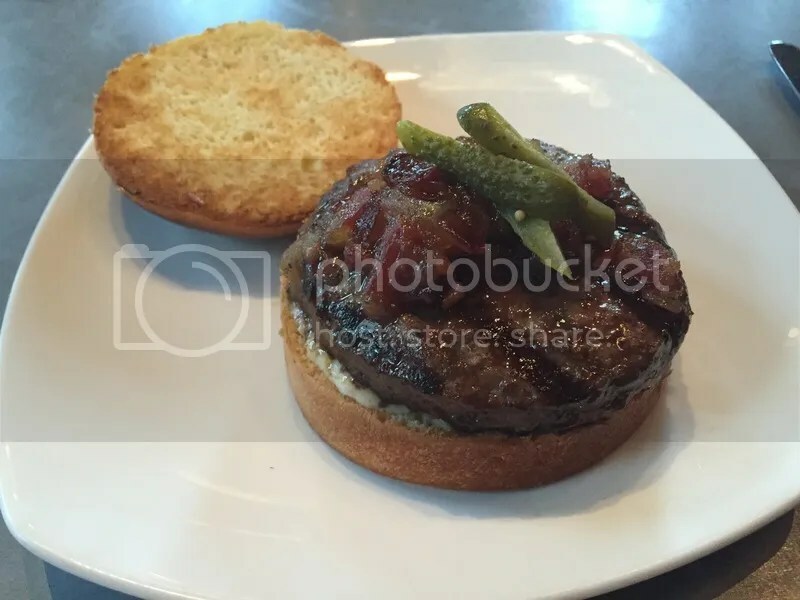 I opted for the namesake Fringe Burger, topped with bacon and caramelized onion marmalade, red wine reduction, pickles, a smear of delice de bourgogne, and corn shoots on a house-baked brioche bun. So, while the burger to bun ratio was perfect, it was maybe a little too perfect. 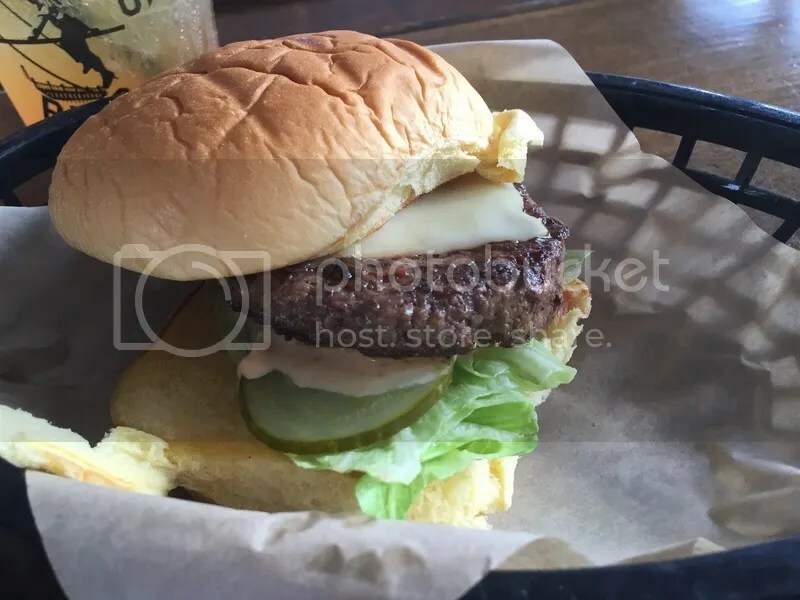 The burger was on the small side & the size of the house-made bun plus all the negative space on the plate made it seem comically small (especially considering it was $9). While the burger was tasty, juicy and cooked to medium as requested, I just couldn’t get over the (metaphorical) bad taste this was leaving in my mouth. Then again, this is probably my own fault for eating at a French restaurant on America’s birthday! I should have opted for The Americaine: a baguette topped with cheeseburger, lettuce, tomato, onion, cornichons, ketchup, mayonnaise, french fries (stuffed in the sandwich). French fries stuffed in the sandwich?! If that doesn’t scream ‘MURICA!, I don’t know what else does. I’ll be sure to come back another day when the weather is better to try it – and maybe even catch one of the movies showing this summer as part of the FringeArts Outdoor Movie Series! Posted in bacon, beer, beer garden, brioche, brioche bun, buns, burger, burgers, cornichons, Delaware Waterfront, french, FringeArts, La Peg. Bookmark the permalink. It was a long, harsh winter but summer is finally here! I’m excited to spend as much time outdoors soaking in the sun and warmth as I can, and along with that, spending time in all the great outdoor spaces that have started popping up around Philadelphia in the past few years. 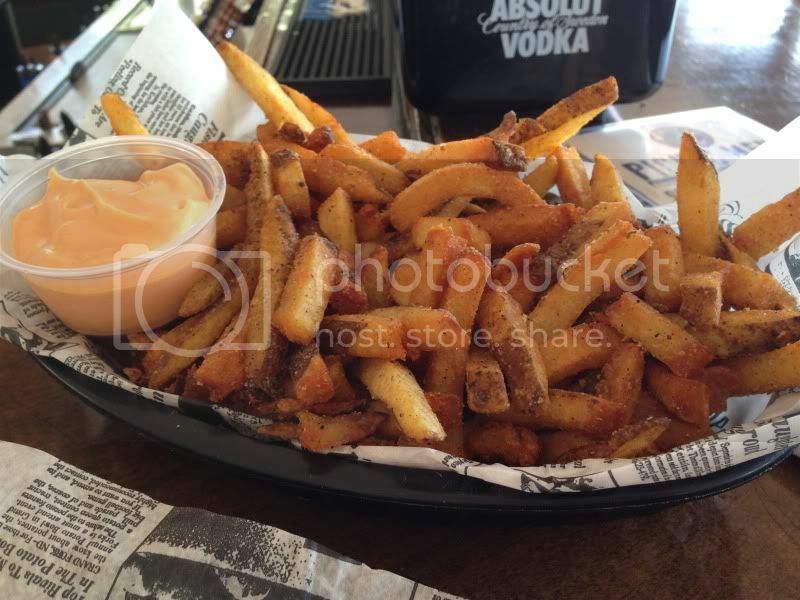 We sure have plenty of places to drink outside and naturally, you’re going to want to eat, too. So for the entire month of July, I’ll be highlighting the burgers around town at various beer gardens. 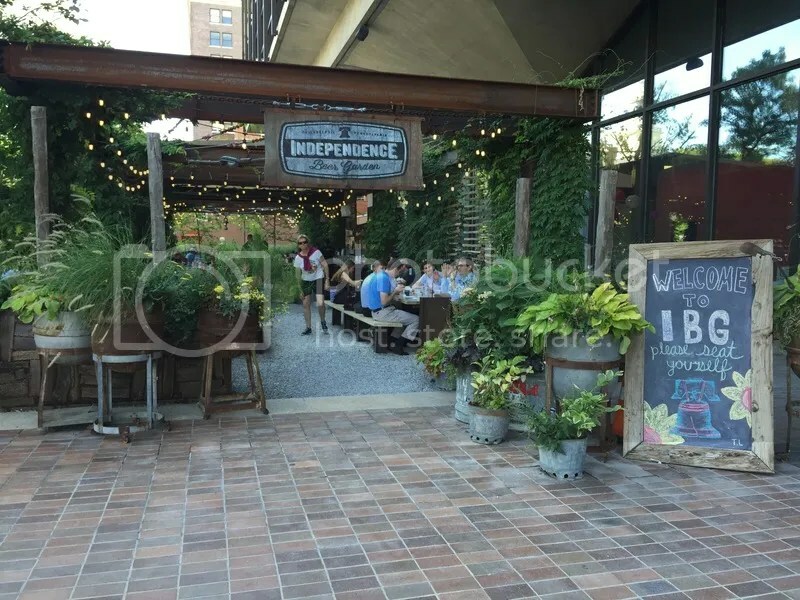 First up: Drury Beer Garden, located behind Opa. You can either access it by heading down that sketchy alley where McGillin’s Olde Ale House is (you know the one) or through the rear door of Opa’s dining room. The DBG Double Down Burger is a two handed, double decker delight: two 5 oz patties topped with house cured bacon, sharp cheddar, beer sauce & a giant tomato slice. I wasn’t asked how I wanted the burger cooked and was worried that the size of the two patties would result in their being cooked to medium-well/well done, but they came out surprisingly pink (I think due in part to the hand-formed shape of the patties). The giant tomato slice made the already large burger a little awkward to eat, but I managed my way around it. The ciabatta-like bun was thick, which was good since there was a lot of grease/meat juice runoff; the bun helped to catch a good deal of it. While the presentation looked nice, it seemed a little cumbersome serving it on the board. The seasoned, hand-cut fries started sliding off and the meat juice/grease that had run off the burger started to pool in the center. I was worried that the busser/bartender would get splashed with it when they cleared my plate! There also wasn’t any place to put condiments (I wasn’t given any and I wish I’d had some kind of aioli or ketchup to enjoy the fries with). Weird plating aside, the burger was really tasty and, paired with a Dogfish Head Festina Peche, a great way to spend a sunny afternoon! Posted in bacon, beer, beer garden, buns, burger, burgers, cheddar, cheese, double decker, Drury Beer Garden, fries, Opa, summer, tomato. Bookmark the permalink.